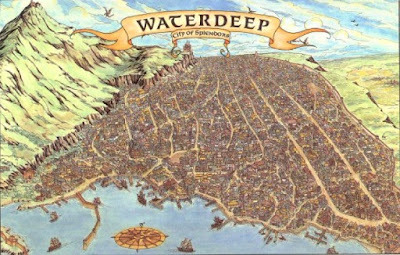 Waterdeep, City of Splendors. We gathered at the Selûne's Smile tavern at the Dock Ward. There were five of us, and we were hustled into an empty room where we were supposed to wait for some woman named Kyriani, the proprietress of the establishment. Chronicler's note: I seem to recall a story about pre-ToT Waterdeep, wherein an avatar of the moon goddess Selûne was manning her own tavern. I believe that this Selûne's Smile was that tavern, and maybe this Kyriani was the goddess herself! I am Set'raith, by the way, an entertainer from Westgate, the cesspool of the Dragon Coast. With me is a cleric of Tymora who calls himself Rokh, himself from Waterdeep; a dwarf named Kiira Stoneblade, warrior-priestess; a giant of a man who wouldn't name himself, but seems to be an earth genasi; and a sorceress named Keliantrie, who wouldn’t show her face, always hidden within a heavy hood. We found out that we each received a letter some few weeks back, from someone who didn't name him/herself. The letter seemed to contain some sort of geas. So here we were. A woman, a half-drow, entered the room. She introduced herself as Kyriani Agrivar, and that a common friend sent us the letters that compelled us to go to Waterdeep. This friend, she told us, saved each one of us in the past and that this summons was the price for that rescue. She offered us a job for which she would pay us 5,000 gold pieces if there were no spoils, else we get to keep the loot. The Selûnite temple here in Waterdeep, the House of Moon and Stars, had a problem. Every time their knights conduct a purging of Sharran sites, their enemies seemed to know exactly when and where they were going to strike. It is likely that a spy is in the temple, and it's our job to find out who, preferably without resorting to violence. Kyriani wants discretion. Looking at the group assembled before me, I thought to myself, "fat chance". The party set off immediately to the Selûnite temple. 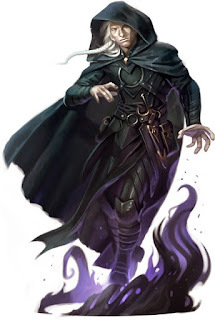 Keliantrie and the genasi, who now insisted we call him "Wonderboy", proceeded to the library on the third floor. Rokh the aasimar and Kiira the dwarf chatted with a group of clerics. The Selûnites mentioned that one of their youngers clerics, Respen, was such an altruist that he goes out to help the needy on an almost every day basis. And there was even this one time that he disappeared for days. As for me, one of the servants gave me a tour of the temple in exchange for a gold piece. The boy pointed out some magical effects around the temple, coupled with some myths and anecdotes. One of the stories he told me was that of Selûne's incarceration in one of the rooms during the Time of Troubles, when she was set up by Shar. He also showed me one of the mirrors on the third floor which the priests used for scrying. There was also another mirror on the second floor, and the kid told me that monsters poured out from that thing once. The priests redirected it somehow to a Sharran temple. (Note: It's quite possible that the Sharrans could have redirected it again, and now used for spying). We returned to Selûne's Smile and discussed our findings with Kyriani. She refrained from giving suggestions, so we decided to send the sorcerer and the genasi to the temple to investigate the mirrors and ask more about Respen, who is now a suspect. The third floor mirror, as read by Keliantrie, could be used to scry any area on Faerûn where the moon shines. Respen's story, as told by the other clerics, began when he was adventuring out in the open sea. Their ship encountered pirates and was sunk. Respen was picked up later by Waterdhavian authorities, floating on a plank. From then on he was adventuring less and doing charity work more. The pair then started looking for Respen. The dwarf cleric went to The Plinth to find out if there were any more dwarven clerics there who might be able to assist us. There were none, unfortunately. Midnight. The beggars Keliantrie and Wonderboy questioned said Respen was somewhere in Fish Street. 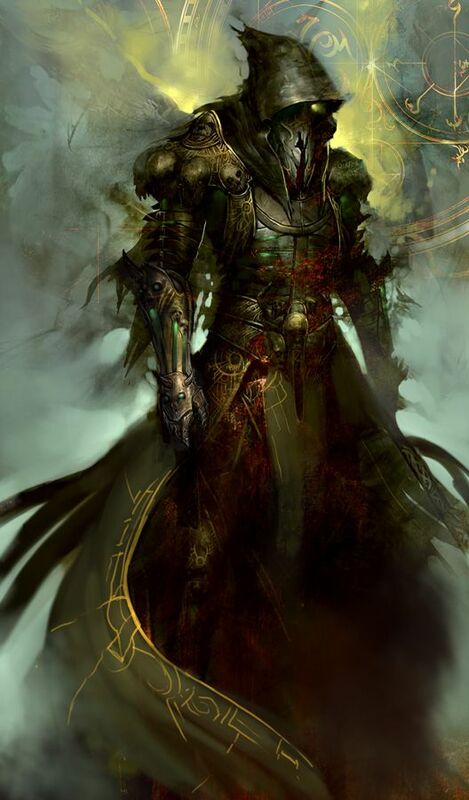 However, Kiira returned to the temple and the priests confirmed that Respen was, in fact, there. There was a mystery afoot but the group decided to get some sleep first. I volunteered to stay at the temple to watch out for Respen. Morning. A young blond priest, whom I believed to be Respen, came out of the dormitory and proceeded to the kitchen. I called for the rest of the group to gather at the front lobby. The dwarf set up an appointment with the Selûnite clergy, and the clerics were able to meet with her and Rokh at noon. They posed as priests who wanted to tag along with Respen's service project. The clergy agreed and Respen said they would meet before sunset and head for Snails Street. I tried to ask the Selûne's Smile bartender about Kyriani's associations. Got zilch. Damn ignorant bartender. Maybe I would have better luck with Kyriani herself. Questions, questions. According to Kyriani, the leakage happens just hours before a raid. Only those directly involved were informed of the details. She said that another raid was planned for the next day, so we had little time left. Rokh and Kiira went with Respen on his rounds that afternoon, while Keliantrie and I tailed them. Wonderboy remained back at the temple and he noticed that a messenger hurriedly ran to the High Priestess. The High Priestess then ran out to her carriage and set out to the docks area, and Wonderboy followed them. They then walked into an alley which was was filled with onlookers. Wonderboy asked an investigator about the incident, and he said that a Selûnite priestess was found dead in the alley, full of scratch marks. Wonderboy sought us and told Respen what happened. Respen was surprised that this stranger sought him just to tell him that news. Wonderboy then told Kyriani the bad news, and she went to the alley herself as well. We all headed back to the Selûnite temple where we eagerly awaited for any news. Dawn came and Kyriani finally came out from the conference with the Selûnite higher-ups. She told us to meet her back at her inn. Back at Selûne's Smile, Kyriani told us that the murdered priestess, Mathilde, was an information gatherer for the church. Before she was killed, she told the church officials that the Sharrans were housed somewhere in the merchants' district. The Selûnites would go on with the raid as planned, except that they would be doing it in full force now. We headed for the warehouse where Kyriani told us that the Sharrans were hiding, but we noticed that her bartender had mysteriously vanished and immediately we suspected that he was the spy. We then ran at full speed to the warehouse. There wasn't any sign of him when we got to the warehouse. Wonderboy and I hid ourselves near the entrance to ambush the bartender in case he did come, while the rest went down the nearest sewer entrance to block the Sharrans' escape. They met some sewer cleaners who told them that it was illegal to be down there. They explained the situation, so the cleaners had agreed to watch the sewers for any cult activity but the group had to climb back up to the street. A couple of hours later, the Selûnites and Kyriani arrived. They stormed the warehouse and found a big — nothing. No Sharrans, no escape routes, no signs whatsoever. Wonderboy noticed that most, if not all, the high-level priests and Moon Knights were present. We then realized that the temple was now vulnerable to attack. As we neared the House of Moon and Stars, we saw smoke coming from it. Many injured clerics were running out of the House. One told us that a group of Sharran monks attacked and looted the temple. And another told us that the Dark Ranger himself was leading them. 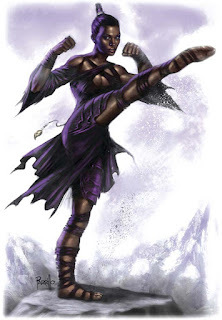 Chronicler's note: My superior bardic knowledge ability told me that the Dark Ranger was a powerful minion of Shar whose real name was Vanrak Moonstar. He used to be a Selûnite and whose father was a high priest of the House of Moon and Stars. 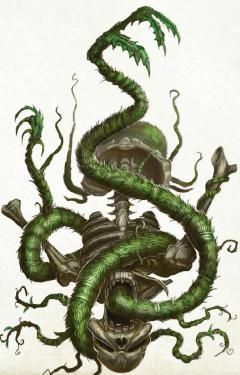 He went adventuring in the jungles of Chult one time but he came back transformed, evil. He murdered his father, other family members, and some clerics. And this happened 600 years ago! The clerics told us that the raiders came through the basement. We went down and searched for the secret door that would lead to the sewers. Wonderboy found it, Rokh cast a light spell, and I checked their escape path through the sewers. We flew and leaped our way through the tunnels and went up through the hole where they came out. We ended up in the nobles' district, just a short distance from the temple. Stiffy, Kiira's celestial dog, caught their scent and we headed north. Rokh flew up when Stiffy lost the scent and caught sight of some suspects, but they all eventually disappeared into some dark alleys. He flew to the North Gate and watched the flow of traffic. He was approached by a Waterdhavian guard mounted on a griffon and was asked to return to ground level. Rokh explained what happened, complied with the griffon-rider’s order, and asked the Moon Knights who followed us to watch the gate. We returned to the House of Moon and Stars and talked to the Selûnite officials. We suggested that they make a quick inventory of their items so we would know what's missing and that they could cast locate object so we could help retrieve them. We suspected that they were still within the city, hiding individually or in small groups. Finding them and fighting them, though, would be real tricky. They are agents of the goddess of secrets, after all. It took some time before the Selûnites and the Waterdhavian officials finished their meeting. The Selûnites had no choice but to leave the pursuit to the authorities since it was illegal to conduct holy wars within the city. Naneatha, the High Priestess, went down into the basement to investigate the Sharrans's entry point. When she came out, she still had her true seeing spell active. She gave Keliantrie and I a surprised stare. She turned to Kyriani and exclaimed, "What have you done?!" or something to that effect. She saw Keliantrie for what she was, a Shadovar, and me, with my alien features and "the mark of Shar" on my forehead. Kyriani led her away and gave her some reassuring words (what those words were, we don't know). And with that, Naneatha allowed us to continue with our task. 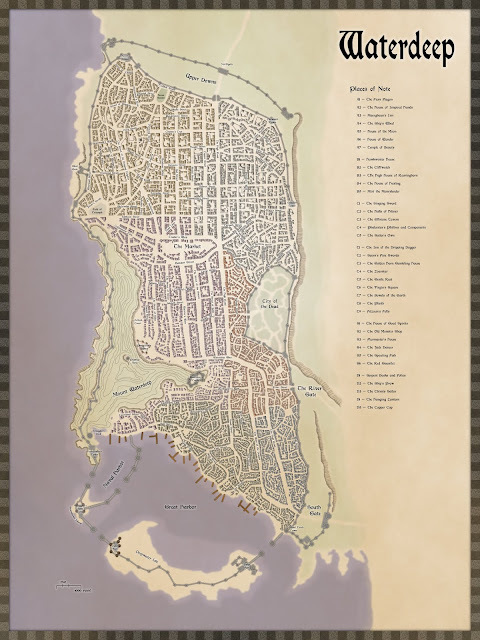 A little while later, the Selûnites received a report that a patrol of the City Watch met some people along the road outside Waterdeep, heading north. One of them matched the description of the Dark Ranger. We immediately set out to investigate, mounted on horses provided by the church. One of the members of the patrol, an elf Guild Mage by the name of Arun, guided us to the spot where they met the suspected group. They were fairly easy to track from the road through the grassland; until we reached the hills, that is. The ground was rocky and uneven, and I had a difficult time tracking them. We went up, down, left and right through the hills, with everyone in the group looking for signs of their passage. After several hours we came upon a large crack in a cliff face, and we knew they were somewhere inside. I went in ahead to scout, aided by Arun's invisibility spell, while they tried to squeeze Wonderboy through the crack. Keliantrie had to cast a grease spell on him to make him squeeze through. A rough stairway about 50 feet long went down from the crack entrance, then leveled off and made a U-turn, and headed straight to a torch-lit corridor. I saw two guards near the entrance. I passed by them undetected easily, and then peeped into a nearby room to find any more people. The guards were dressed in simple peasant fashion, something that was a bit surprising, but expected if you think about it. I went back to report my findings and to formulate a plan with my party. The charge was led by Kiira, followed by Wonderboy and Rokh. But I went on ahead in case one of the guards decided to run, in which case I had to block its path. The dwarf charged into the corridor; the clanging of her armor alerted the guards, one of whom shouted an alarm. Kiira took care of the first guard with a single stroke of her axe. The second one passed by me and I gave him a hurtful stabbing and whipping, but he did not fall yet. Wonderboy was fast enough to catch up to him, and he gave the Sharran a knuckle sandwich. The poor sod was out cold. Keliantrie used her innate invisibility ability and went inside the nearby room. She didn't find anything, but we knew someone was there before (someone threw a thunderstone earlier). We proceeded down the corridor full speed, and we triggered an alarm. Now the whole complex knew we were here. We came upon a room with some tapestries. We couldn't interpret exactly what the artworks portrayed, but we all felt feelings of loss and hopelessness. A spell effect, no doubt, and only Rokh was able to resist. At the other side of the room was a large hall with pillars, so we decided to go into a side corridor instead. The corridor was about 20 feet wide and about 60 feet long, and led into a large cavern with a pool. Rokh went into the cavern first and were ambushed by a couple of "peasants" with crossbows. A dozen more Sharrans in peasant garb were behind them, hiding in the shadows. We then all went in and chose our respective targets. Rokh's and Wonderboy's opponents were giving them a hard time with a spring attack maneuver, but their magically keen curved blades dealt unhealthy doses of damage to the axe-wielding monks. Kiira was facing two opponents, so I maneuvered for a flanking attack with her while Keliantrie hit one with her magic missiles. Outnumbered, they decided to attack the seemingly weak Arun instead, but we were able to finish them off before they could hurt the elf wizard. As soon as we finished searching the bodies, we went out into the large hall with lots of pillars. At the end of the hall there seemed to be some kind of altar, so we decided to go back into the cavern instead. The cavern floor was a slick and a bit angled, thick liquid running from the walls to the center. The liquid might be some kind of "Styx water" so we didn't touch it. There was a tunnel at the other side. We took it, and it ended into a walled corridor. It was unlit unlike the other corridors we passed. I took the point, while Keliantrie followed about 20 feet behind, the rest about 60. I was walking along the center of the corridor, which was about 25 feet wide, when the floor suddenly gave way. It was a pit trap filled with spikes, and I narrowly escaped with my hide. I searched the floor and found another one, to the right and forward. I then searched the left side, unfortunately for me the trap was offset and I fell into the pit. I flew out and landed on the other side which was, luckily, stable. The others arrived, and we figured we could make the jump easily. Went Keliantrie and Kiira (with her dog) got to the other side, Wonderboy and I went back to ferry Rokh and Arun. Just then, four Sharran monks appeared and started firing their crossbows. They also threw thunderstones and smokesticks, which made the crossing and ferrying back over the pits difficult. Kiira charged but she fell into another pit, and Keliantrie turned invisible. It was risky to ferry Arun to the other side, so I polymorphed into a bat and flew straight down the corridor to look for other enemies. Wonderboy and Rokh took the risk and jumped back to the other side. The monks still kept throwing their smokesticks and thunderstones. As soon as the smoke cleared, Wonderboy jumped over the new pit and charged the monks. He made the jump, but the monks resisted the charge and they pushed him into the pit with Kiira. 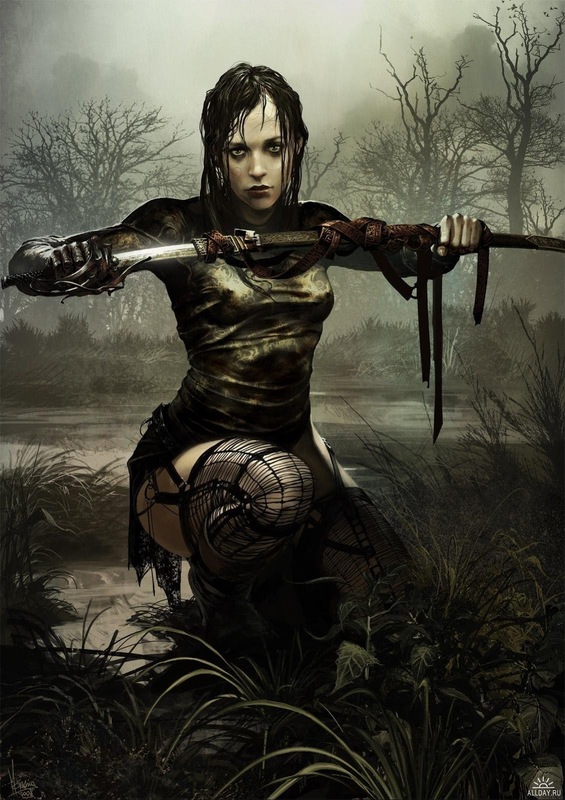 Keliantrie let loose an acid arrow, damaging a monk but dismissing her own invisibility in the process. Rokh activated the fly power of his enchanted armor and flew to the other side, positioning himself just a few feet behind the monks. I flew back using my cloak of the bat and positioned myself near Rokh, but I triggered a new pit trap and fell into it. A male voice spoke to Keliantrie, "Do not resist, child of shadow. There is no hope against the dark goddess' call." She felt herself being compelled to surrender, and just sat there feeling hopeless. Arun was left alone on one side of the traps, without the benefit of darkvision. He was attacked by another monk but he/she/it missed. Arun cast a light spell on his longsword in order to see his adversary, but there was no one there. He then cast an area dispel magic and now the monk was without the benefit of his invisibility spell. The monk then decided not to engage Arun and jumped away to confront Wonderboy, who was then climbing out of the pit. At the other end of that melee, Rokh was desperately fighting off four monks. He managed to push one down into the pit into Kiira's waiting axe. Then an energy attack hit Rokh, but he managed to shrug it off. Sensing Rokh's new adversary, I hid myself in the shadows waiting for him/her to show him/herself. Then a female voice spoke, "Trying to hide from us, are you? You cannot hide from the goddess of secrets…" I then felt hopelessness and sat there in the pit, motionless. With one of the four original monks finished off at the bottom of the pit with Kiira, the battle seemed to be going in our favor, though just slightly. Wonderboy battled the newly arrived monk and dealt massive amounts of damage (though he missed quite often). Rokh was able to push another one down into the pit, but this one was giving Kiira a hard time with his tumbling maneuvers. Then an object flew passed us and hit Arun — a chakram, a disc-like throwing weapon favored by clerics of Shar. Wonderboy could not quite finish off the boss monk, even with Arun helping him with his spells. Rokh was able to immobilize one of his opponents with a hold person spell, and he summoned a spiritual weapon to aid him as these monks have already dealt him a large amount of damage. Kiira's opponent was continually giving her the tumble. Keliantrie and I just sat there uselessly. Then someone, or something, stabbed Arun. His lifeless body fell on the dungeon floor. The details have become blurry for me as I was in a deep, melancholic state. But as far as I could tell, Rokh was able to kill his opponents with his spiritual weapon and Kiira eventually made a critical hit and killed off her monk as well. Wonderboy was able to defeat the boss monk, too (the boss monk, we found out much later, was a divine seeker). And then there were two. Arun's killer was a good fighter. 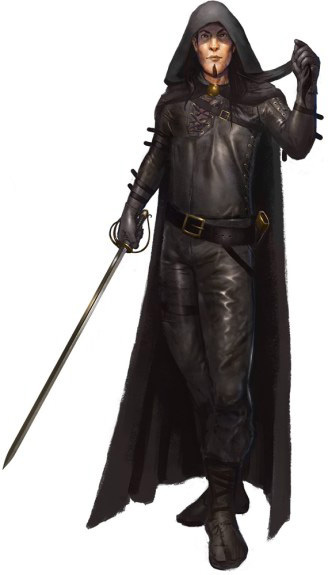 His favored tactic was to throw a chakram first then draw his rapier and dagger for melee. The other one, whom we assumed to be the female voice that spoke to me, threw energy attacks at Rokh and still remained invisible. The fighter dealt lots of damage to Wonderboy, so the our earth genasi had to back off to drink some cure potions and left Kiira to face him alone. 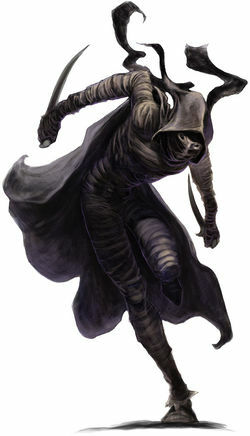 Then the fighter, whom we assumed at this point to be the Dark Ranger himself, scored a critical hit on Kiira, killing her in a quick, successive strokes of his two blades. As soon as Wonderboy regained his strength, he reengaged the Dark Ranger and forced him to back off. Probably heavily wounded, the Ranger flew off in the direction of the altar. And the woman seemed to have disappeared as well. The two survivors, Rokh and Wonderboy, waited for the effects of the hopelessness spell to wear off from me and Keliantrie. And, as standard procedure, we gathered all the possessions of our slain enemies and looked for anything valuable. After a couple of hours of resting, we proceeded to the altar. Suspecting some kind of magical trap, Rokh volunteered to go in first. Our suspicions were correct, but Rokh's strong will repelled the compulsion effect. He then guided Keliantrie to the altar (which was just Shar's holy symbol mounted on a wall), and she covered the thing with a darkness spell. We suspected that there was some kind of secret door around the altar, so we searched the place for about an hour. Then Rokh heard a grinding sound from somewhere farther — we were being sealed in! When we reached the tunnel leading outside, it was blocked by a thick stone wall. We were trapped inside, and our enemies were probably riding into the sunset with a happy grin on their faces (or not, they're Sharrans, after all). We went back into the complex only to discover that it was now full of gray ooze (the liquid we saw earlier were actually slime monsters). We retrieved the bodies of our fallen comrades and set up camp at the entrance tunnel, away from the oozes. It took two days' worth of stone shape spells from Rokh for us to get out. We sealed the cave entrance behind us and went back to Waterdeep. Reporting our failure to Naneatha and Kyriani wasn't as difficult as we thought. After all, we killed all of Shar's monks; and it was the Dark Ranger himself who killed our companions, indicating just how difficult the encounter was. 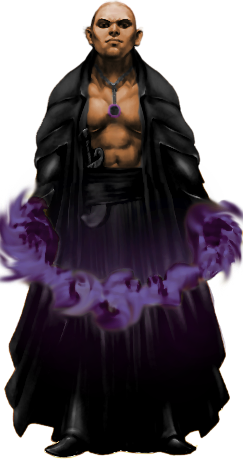 We had Kiira raised back from the dead, and Arun's body was turned over to the Order of Magists and Protectors. Rokh was able to convince Naneatha to make him a scroll of discern location so we could follow the Dark Ranger. It took three days and a couple thousand gold pieces (courtesy of Naneatha herself) to finish the scroll. Rokh successfully cast the spell, and found the Dark Ranger somewhere along the Trade Way, the road south of Waterdeep, a day away from a landmark called Dragonspear Castle. He had a five-day head start, so pursuing him on horseback was out of the question. We needed a teleport spell, but we were out of funds. 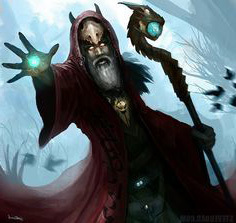 Kyriani recommended we get in touch with the following wizards: Tessalar, Maaril, or Nain. They all lived in Waterdeep’s Sea Ward. Rokh volunteered to go to Nain, the ex-adventurer who lived on Sea Watch Street. Unfortunately, she didn't have the spell readied. He went to Maaril next, who lived in a dragon-shaped tower. Maaril was a little gruff, but he told Rokh to return with us the following morning. I tried to earn some money that night in order to help out with my new group's financial issue. I went to the Ship's Wheel Tavern to sing and dance, and I was able to earn a measly 5 gold pieces. Good job, Seth. We went to Maaril the next morning. As it turns out, the man Rokh spoke to the day before wasn't Maaril. The man led us into a throne room-like area where the real Maaril sat, flanked by a couple of iron golems. He warned us that it had been some time since he saw the Trade Way or Dragonspear Castle, but he would be willing to cast teleport for us at no charge. Thank you, Maaril the Dragon Mage, for your generous aid. Maaril brought us to Dragonspear Castle safely. We walked north a bit, discussing how we would deal with Vanrak and his companion once we encounter them. After all, they could be part of a caravan and we wouldn’t recognize them. We stopped walking after two hours, but Rokh continued on to scout. He spotted a caravan, but since it was already afternoon we just decided to wait until nightfall and let Keliantrie look around when they stop for camp. Keliantrie went in invisible and used her detect magic spell to look for anything unusual such as powerful magic or Shadow Weave items. There were none. We decided to approach the caravan guards and they did say that two people, a man and a woman, came with them from Waterdeep but went their own way from The Way Inn, which was about a day away. Rokh's discern location spell found them camped along the road somewhere between us and the inn; so if they did proceed south we should have encountered them. We thanked the caravan guards and proceeded to where Rokh discerned the Dark Ranger's location. We searched the sides of the road for any signs of their passing. I found a recently used narrow trail leading to the Trollbark Forest, so we walked for an hour and made camp for the night. The next morning, we went into the forest. The trail seemed to continue through it, but oddly the trail widened enough to accommodate a wagon-sized thing. We walked for a while, then we encountered a weird vine with hand-shaped leaves, and it was moving. I summoned a celestial badger for bait, but it wouldn't budge so Wonderboy threw it into the vines. The thing choked the poor badger to death. Then suddenly, the grass and plants around us writhed, like somebody had cast entangle on us. Rokh and the dog Stiffy got trapped and the rest of us moved forward. Wonderboy was snagged by the vines, and it dealt him lots of damage. Kiira cast searing light and Keliantrie cast magic missile, they killed a vine. The dog eventually got free, and the sorceress kept hitting the vine with magic missiles. Rokh cast bull's strength on himself, and Wonderboy had to drink a couple of potions since he was badly wounded at this point. Kiira moved forward, and I tumbled past the vines. Wonderboy struggled free. Kiira hacked with her axe, then Rokh cast freedom of movement and got past the vines. Wonderboy jumped and ran, and Keliantrie continued to barrage the vine with magic missiles until it died and withered away. As soon as Rokh got to the other side, he used his detect evil ability to find the one who cast the entangle spell. There was none. It's been two hours since we entered the forest. An hour later, we were still walking, and the trail was getting narrower. Another hour, and the trail disappeared altogether. We went back to where the trail disappeared, which was about 30 minutes from the outside edge of the forest. The trail disappeared gradually so now we are not sure if our quarry did enter the forest. Kiira cast a divination spell; she asked, "if we walked straight into the forest, would we find the Dark Ranger whom we seek?" The response was, "The darkest place within hides the darkest deeds and the foulest evil." So we went back into the forest and slashed our way into it. 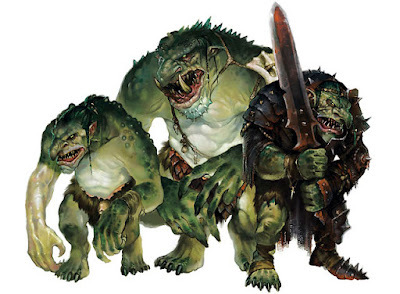 After about 30 minutes, we spotted three trolls charging in our direction. Wonderboy he made short work of the trolls with successive critical hits, with Kiira and Rokh fighting beside him and Keliantrie firing her magic missile wand. They just kept regenerating. Kiira coup de grace'd the downed one with her flaming axe. One of them took me down, but Wonderboy killed them all. The other two that Rokh and Kiira fought ran away. It's now the 18th of Tarsakh. Rokh cast another divination spell to confirm our direction. The answer was, "The path you chose was chosen for you. Seek help from someone who would normally oppose you." We went on our way. A few hours later, we were ambushed by six 5-foot spiders. Keliantrie was bitten by one, and the spider's poison drained some of her strength. Kiira killed one with her axe, but Keliantrie was caught between two spiders. We eventually killed most of them, one got away. We continued traveling until we reached a stream. Rokh decided to fly up and survey the area. From above, he saw that we were nearing the forest’s other edge. It was fairly obvious that we missed whatever it was we were looking for. We were a bit desperate now, we've already spent two days within the forest trying to find any clue as to where the Dark Ranger might have gone. We went back up the path and camped there for the night. I flew around the area in bat-form trying to find any sign of our quarry, but found nothing. The next morning (19th of Tarsakh), Kiira cast a speak with plants spell on one of the trees where the open path ended. The tree told us that humans dressed in animal skins with "dogs that aren't dogs" made and cleared the path before and after winter, but it hasn't seen any humans recently nor does it know where the "darkest place” is. We were still stumped after the conversation with the tree (pun intended). Rokh and I decided to take another stroll down the path, searching the edges for any clue. We didn't find any, but I did find four skeletons near the assassin vines that we killed. They've been there for quite some time, so their bodies and gear have rotted away. But we did find 200 gold pieces on them, a magical shortbow, a magical greataxe, and a vial. Upon Keliantrie's suggestion, we went back to the place where we killed some worgs earlier. The worgs weren't there anymore, so we let Stiffy track the carcasses' scents. I found tracks, probably elven. We followed the tracks to a small clearing where we found the butchered carcasses. Kiira saw a humanoid figure watching us from 50 feet behind the trees. I stalked the spy and saw that it was a wood elf female. I went back and told Rokh, and he called out in the Elven tongue to the elf that we came in peace and that we only need to ask her a few questions. She agreed to talk if we gave her some decent food and weapons. Rokh approached her alone, with Wonderboy's figs, nuts and fruits; Kiira's chunk of meat; my short sword; and the magical shortbow that we found. She said she hasn't seen any humans lately, but she does know the "darkest place" that we were referring to. She agreed to take us there if we gave her the shortbow. We did, and we were finally on our way. She told us that she had been roaming the forest for six months, the place that the Sharrans were now occupying was once hers. She became a prisoner for a while, but she escaped and was now on the run from her captors. As we neared our destination, we went through a narrow path running along a hillside. The wood elf, who was scouting ahead, told us that she felt something evil and that she would go ahead and give us a signal if everything was clear. But Rokh had cast a detect evil spell on her earlier and she was, in fact, evil, so I decided to follow her in case she led us to an ambush. Stiffy started barking, and everyone prepared themselves for combat. I followed the elf for about 500 yards, then she disappeared. Then an incorporeal hand appeared from the ground and tried to grab Keliantrie. The elf tapped me from behind, angry that I was following her. I wasn't in the mood to deal with her idiosyncrasy, so I just told her that we'd just better see what the dog was barking at. Four wraiths floated up from the ground and attacked the main party. But before they could do serious damage, Rokh and Kiira successfully turned them. A fifth appeared then, probably a leader-type, but it, too, was turned by the power of Tymora. And so we went on our way. After a few minutes of walking, we came up on a large gully (more like a big hole in the ground). 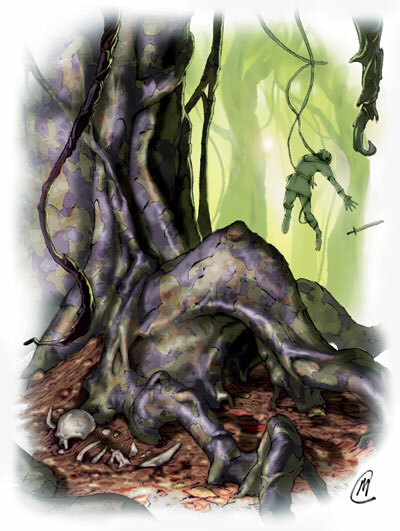 Dominating the area was a large shadowy tree, which I assumed was an umbral bunyan — a semi-sentiment tree native to the Plane of Shadow. As we walked down the trail to the umbral bunyan, we spotted a doglike creature at the top of the cliff ahead of us. It howled a frightening howl, I succumbed to its fell power and ran away. The rest of the party fired arrows at it. As I flew away, two men (probably Shar's rangers) also fired arrows at me. The dog retreated after taking some damage from the elf and Keliantrie. (We then guessed that the dog was probably a shadow mastiff, another nasty denizen from the Plane of Shadow.) Kiira, Rokh, and Wonderboy killed one of the men, then Wonderboy chased the other down and subdued him with the flat of his falchion's blade. I asked the party to let me question our unconscious opponent. They agreed, of course. And when we took off for their hoods, we found out that they were tieflings, bearing the mark of Shar upon their foreheads, just like me. They were rangers patrolling the forest for the Sharran cell based there. I asked him their strength and numbers inside their hideouts. And, as expected, he refused to answer. I tried the old splinter-under-the-fingernails routine, but he simply held on and clammed up. I crushed some glass vials and put them in his mouth, and slapped him continuously while questioning him. He finally squealed and told us that their base wasn't heavily guarded, with only about 10 or so people inside. He told me he didn't know about any Dark Ranger or female cleric or anyone arriving within the past few days. I thanked him and slit his throat. We went back down to the gorge, and stopped when we neared the umbral bunyan. The tree was massive, it's trunk about 25 feet in diameter, dark vines hanging from branches almost 100 feet high, and even darker leaves forming a thick canopy that blankets the entire gully in shadows. The elf told us she dug a hole on the other side, so we slinked along the wall steering clear of the tree. I wanted to kill the tree before we proceeded to the hole, but the party decided against it and we went on our way. Kiira and Keliantrie took a peek inside the hole the elf dug. Then and eerie voice half-whispered, "Heat. Warmth. It's been so long." Shadowy, incorporeal hands reached out and attacked. Kiira stood her ground and hacked at a shadow, while Keliantrie moved back and let loose a volley of magic missiles from her wand. The umbral bunyan's vines moved. Wonderboy, Rokh and I were caught by the vines, trying to drain us of our physical strength. Wonderboy slashed at his vine and fell to the ground, and managed to sever another vine afterwards. Rokh was also able to free himself, then I got away with Keliantrie's help. We steered clear of the vines, concentrating our efforts on the nine shadows that emerged from the hole. While Wonderboy and Kiira hacked and slashed with their weapons, Keliantrie continued her magic missile barrage. Rokh the aasimar cast a searing light spell on one of the undead monsters — he got lucky and struck the leader, killing the shadow instantly with divine light. The elf, weakened by the shadows attacks, retreated and turned invisible. Within a few minutes, we finished all the shadows and turned our sights on the umbral bunyan. Told you so. The elf, almost killed by the shadows, sat down in one corner of the gorge. We hacked on the tree with all our might. As it neared its end, it used its innate ability to plane shift back to its home plane. We all found ourselves in the dusky, lifeless landscape that is the Plane of Shadow. Everyone panicked (except me, naturally). I'd rather not recount the painful verbal abuse I received from my companions. We also got to thinking that Shar herself might be watching us, since this was her home plane. We looked around for any signs of creatures, but we didn't leave the umbral bunyan's immediate vicinity. After spending about 30 seconds in the dreary plane, the tree shifted back to the prime material. We were back safe and sound, but they beat me up nonetheless. We finished the job with missile weapons, and the tree withered. The party decided to rest first before we went back to the hole, so we marched back up the trail to set up camp and spent the night there. We proceeded to the hole and crawled in. It was a pretty tight squeeze, only about a couple of feet wide. Then there was some kind of a blockage about 50 feet in, but it was easily removed. Rokh, who was first in line, triggered a glyph of warding and an alarm sounded. We decided to continue despite the alarm, since the elf said we were already halfway through. We entered the elf's former cell. There were no lights, and all was quiet. It was a small cavern with five smaller niches, which were barred to become cells. On one end of the cavern, opposite us, was a flight of stairs that sharply turned to the right. There was torchlight at the top, and we heard screaming and shouting like someone was being tortured. After a while the screaming stopped, and footsteps could be heard descending the stairs. A scimitar wielding guard was dragging a prisoner. Rokh and Keliantrie were able to surprise him and the guard was dead before he could scream. We brought the prisoner to the rear cell and cured some of her wounds. When she came to, we asked some questions but she wanted to see us first (we had darkvision, we forgot humans couldn't see in the dark), so Rokh cast a light spell. She said she was a clerk of Selûne; she was abducted by a man and a woman while she was staying at The Way Inn. She said she didn't know anything about any artifact or who her abductors were. We just told her to tag along behind us since she had no weapon, armor or holy symbol to use if she got into a fight. A second guard came down the stairs looking for his partner. Wonderboy and Keliantrie were watching the stairs, but the guard saw them and made a break for it. The two caught up with him, fortunately for us, and were able to kill him before he got far. Two sets of stairs connected three small caverns. First was the dungeon, next was some kind of torture chamber, and the last was full of supplies and food. There were no guards, but every cavern was lit by continual flame torches. At one side of the supply room was a trap door at the top of a ladder. I asked the elf if she knew what was at the other side of the trap door, and she said that it was just a big cavern when she lived here — but she heard a lot of construction work going on while she was a prisoner. I climbed up the ladder and opened the trap door. There was some kind of trap that I failed to notice (that's why it's a "trap door"), but I somehow managed to evade it. I heard footsteps on the other side; they were distant so I decided to go in. I saw a room so ghastly words fail to describe it — it was the kitchen. Wonderboy was so happy. Everybody entered the kitchen quietly. I took a peek outside the door when the footsteps disappeared. There was a hallway, about 20 feet on each side of the door, and double doors right in front of the kitchen door. Apparently we were on the west side of the cavern. When the footsteps came again, Wonderboy set himself by the door to ambush the patrolling guard. As usual, the poor sod was slashed in half when Wonderboy delivered a mighty blow with this large, curved sword. When a second set of footsteps came, we hid the body and Wonderboy repositioned himself. But this time, the guard was too fast for him. As soon as the guard saw Wonderboy, he shouted an alarm and ran back northward. Wonderboy and Keliantrie were able to kill him before he got too far, but by now the whole complex was alerted to our presence. Kiira joined the two to secure the North corridor, Rokh and I stopped by the door on the southwest corner. Rokh and I heard some movement in the room in front of us. We opened the door and saw two men, one helping the other put on his armor. I tumbled in for a sneak attack and positioned for a flanking maneuver with Rokh. The two, whom we later identified to be Sharran clerics, didn't stand a chance and were cut down. Wonderboy barged into the northern room and was met by four warriors, two with swords and the other two with polearms. Kiira joined the fight, but the guards' excellent tactics with reach weapons were giving my two companions a hard time. Two people from each of the northeast and northwest doors emerged. The men from the northwest were armored, probably clerics, but the other two weren't, probably wizards. 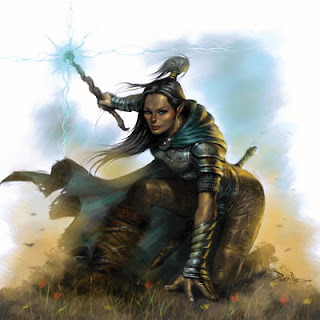 Keliantrie immediately launched a volley of magic missiles from her wand at the clerics, and Kiira left the northern room to engage the wizards. With a searing light spell, Kiira instantly killed one of the wizards, and she proceeded to hack the other to bits with her fiery axe. After a short exchange of a defensive spells, Keliantrie finished off the other two clerics, and Wonderboy finally killed the guards in the room after receiving much damage himself. A woman came down on the southeast stairs, armed and armored. She cast some nasty shadow-based spells on Rokh. She was difficult to hit but another sneak attack from my trusty sword of subtlety brought her down, but not before another four guards came out of the south room and another pair of wizards from the southwest stairs. The guards immediately engaged us while the wizards took their time to cast some protection spells. A huge half-orc wielding and even huger axe came down from the northwest stairs. Before Wonderboy could do some serious damage on the brute, he had to fall back to heal some of his wounds. The half-orc was hacking and slashing at Wonderboy and Kiira, dealing with lots of damage. 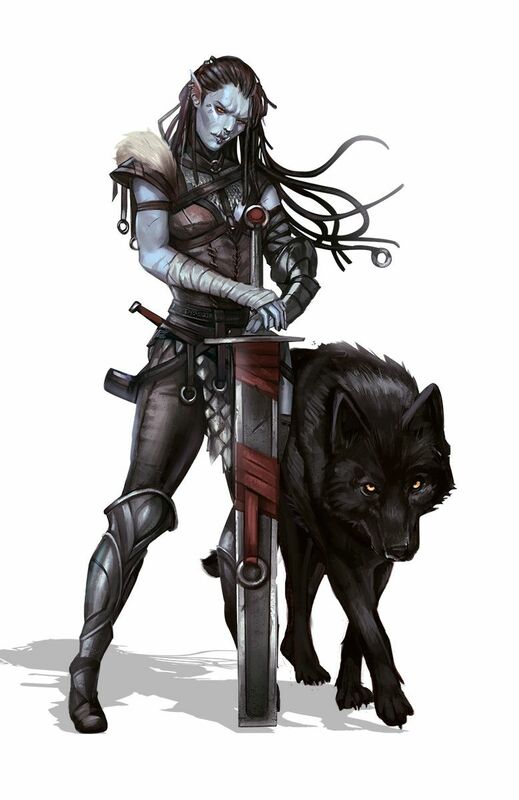 Keliantrie dealt little damage with her magic missiles, but the partially recovered Wonderboy finally hit the half-orc where it hurts and killed him. Five people — four guards and a female leader — were moving in from the eastern door. On the southern front of the war, Rokh and I were pinned, so we requested aid from the elf and the Selûnite woman who were still in the kitchen. They didn't come out, but Keliantrie came to our rescue and launched a volley of magic missiles. While Rokh fought with spell and sword, I cast faerie fire from my wand, illuminating the three guards who were left, and Keliantrie moved in with her darkness spell. The aasimar was able to finish them off with ease. Kiira and Wonderboy were steadily losing ground. The guards they were fighting were, in fact, monks, and went tumbling about and kept flanking the two. Wonderboy concentrated his efforts on the female leader, and she only got the chance to cause trouble for a mere couple of rounds. The two wizards cast magic missile on Kiira, but she had a brooch of shielding on which repelled the spell. After a tough fight with the monks, Kiira went after the wizards and killed them with one slash each. A young woman came down from the southwest stairs (better late than never). She fought Kiira with rapier and whip. She knew she was outmatched so she ran back upstairs. I removed my magical disguise, so as to look like one of the tiefling rangers, and intercepted her. When she saw me, she of course had doubted that I was one of them, but she barked orders at me nonetheless. I attempted a sneak attack but she saw it coming. When my companions had caught up, Kiira and I managed to flank her for a short while before she tumbled out and ran. The young woman disappeared; it took us a while to search the whole damn place for her but she didn't turn up. Rokh went into the kitchen to check up on the elf, the Selûnite and Stiffy the dog. When he opened the door, the Selûnite was lying dead on the floor, and the elf and the dog were gone. As he checked the woman's body, something attacked him from behind — a tall, hideous, old woman! It tried to claw at Rokh, it even had a small demon-like creature assisting it. But she escaped by turning invisible before Rokh could retaliate. Curse her sudden but inevitable betrayal! The elf, whom Rokh had sensed to be evil, was actually a hag that the Sharrans evicted; and by helping us, she knew she could get her lair back. That thing with her was probably her quasit or imp familiar. Why she killed the elf and the dog was unclear. Kiira was weeping un-dwarf-like for the loss of her celestial dog. We never saw her again after that encounter with the aasimar. We checked every nook and cranny in the whole complex for the young woman (except in the central room, whose double doors were ensorcelled with glyphs of warding). Eventually Rokh and Wonderboy found her hiding in the south room. They cleaved her in half. We dumped all of the bodies in the south room after we sequestered their items. Except for the warded central room, we search the whole complex for anything of value. We found some money and four spellbooks in the lower levels. The upper levels had no rooms but was otherwise identical to the lower level. Four secret doors were found in each corner, each leading to a room with better gear. Apparently, they belonged to the more powerful Sharrans we killed, but we've only encountered three of them so far. Aside from some potions and coins, we found an empty ornate box which gave no clue as to its purpose. There were also some letters signed by someone named Alenor Moonstar (must be related to the Dark Ranger, Vanrak Moonstar). In brief, she said something about a transformation ceremony, that it would take five days, and that all that was needed was the artifact. It was addressed to her father — probably the Dark Ranger. Ha, the SOB had a daughter, how cute. We were running out of resources. Only a few vials of cure potions were left, and the spellcasters had run out of spells. It was only early afternoon but we decided to call it a day. We gathered large junk such as beds and footlockers and blocked the three double doors, in case there was some monster in there eager to fight us. The next day, Wonderboy found one of the bodies missing — the young woman’s, the one with the rapier and whip combo. The bloody trail led to the south facing double door, which was now slightly ajar. Someone from the inside stole her body during the night. As we looked around for more disturbances, Keliantrie spotted a tiny object darting about. She fired a magic missile at it and it fell to the floor. It looked like a fleshy eye. I think they were either eyeball beholder-kin or some sort of scrying spell. We removed the junk blocking the doors and took a peek inside. Nothing but darkness. Since nobody else could see into the magical darkness but Keliantrie, she stood by the doorway as we opened the left door. As soon as she got a glimpse inside, she ran to the southwest corner and told Kiira what she saw — an altar to Shar, and armored man wielding a scimitar, two arcane spellcasters, a priestess of Shar with a rapier, and the missing dead girl lying on the altar. Our party clerics, Rokh and Kiira, tried to cast spells into the darkness — no effect (Rashemi accept)! 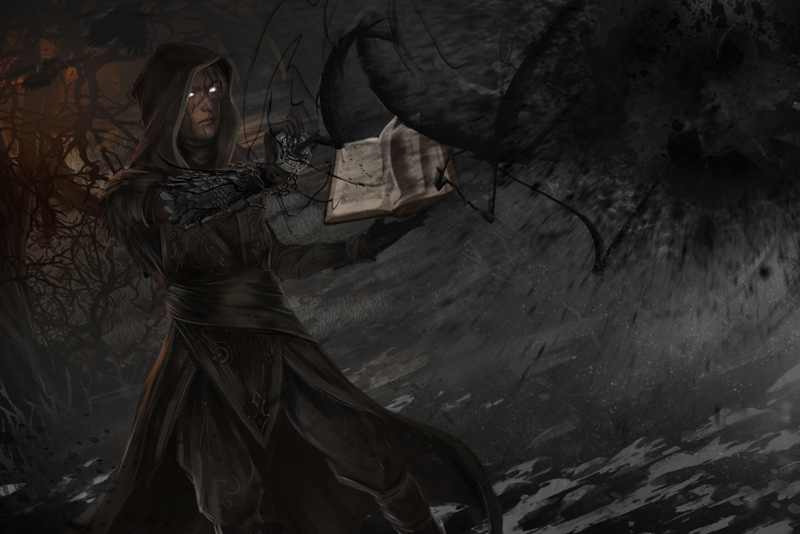 Kiira's protection spells were dispelled as soon as she entered the area of darkness. At first we thought it was just an antimagic field, but then we realized later that it must be a dead magic area. Dead, at least, to weave users. As we stood there in the corridor trying to think of a plan, a cloudkill spell covered us. Wonderboy kept firing his bow blindly into the darkened area. The rest of us moved away from the spell affect, except Keliantrie, who apparently succumbed to the noxious gas (we weren't sure since she was inside her darkness spell). Then someone attacked Kiira from behind. It was the Dark Ranger again. Kiira suffered a lot of damage from him, but she fought on. Rokh ran around the north side in order to flank him, Wonderboy kept firing into the darkness, and I tried desperately to activate my faerie fire wand in order to outline the Ranger with light. The dwarf cast a spectral stag spell and charged into the area of darkness where the Ranger was hiding. Wonderboy joined the fight, but he took too much damage and had to back off from time to time to heal himself. I was finally able to activate my wand, now the Ranger was outlined in purple light. Kiira mounted her spectral stag and made another charge. Rokh pressed on with his attack, while Wonderboy continued to lick his wounds. Kiira tried to pin our opponent to the wall, but that the creature was too strong to knock back and he ran unnaturally fast to the southwest stairs. We all pursued him upstairs, taking different routes in order to surround him. He was waiting for us in the upper floor west corridor, and my companions bravely reengaged him. But after a brief exchange, he blinked out of sight. We assumed he used a dimension door, so we went back downstairs. He was there all right, in the middle of Keliantrie's darkness, back to full health! 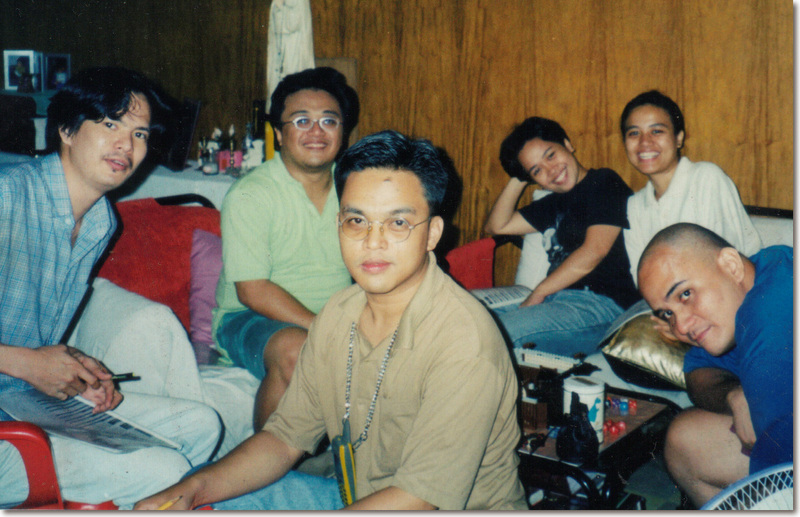 We were all badly wounded at this point, and the mage was MIA (or KIA). We tried flanking him, but he was just too fast and too hard to hit. A critical hit with his rapier mortally wounded Wonderboy, and the genasi slumped on the floor bleeding to death. I went down next, my sneak attacks were no good and my feinting maneuvers did very little. Kiira was hitting him left and right with axe and spell. But she, too, fell by the Ranger's blade. Rokh was the only one left standing, but both combatants were already seriously wounded. Knowing that he wouldn't last six seconds with the Dark Ranger in melee combat, Rokh distanced himself from the enemy and cast another searing light spell. The aasimar, our went last man standing, stood triumphant over the fallen Ranger. Rokh's remaining orisons and a few vials of cure potions were enough to get us back up on our feet. The Dark Ranger was indeed a very dangerous opponent, but luckily we did not have any permanent casualties (yet). Keliantrie's body wasn't in her circle of darkness. However, we found her alive and well near the exit. Her account of the events since the cloudkill spell hit her was a bit strange, even for us. She mentioned something about a male shade who whispered things to her while she was barely conscious (or in a dream state). Her story is probably better left untold, or at least until Keliantrie herself could figure out what really happened to her. Whether real or imagined, those events somehow unlocked some hidden power from within her. Munchkin. We rechecked the complex, inside and out, up and down. The southern double door was gone, replaced by a wall of stone. The two other double doors were still there, complete with their own glyphs of warding. We decided to wait another day before engaging the people inside the central temple, since we were out of spells and cure potions. We discussed our plans for the next day in a hush-hush manner, in case they were magically eavesdropping. The rest of the day was uneventful, no attacks or obvious scryings. We slept peacefully that night even if danger was just on the other side of a 3 inch barrier. As soon as the spellcasters were done preparing their spells, we positioned ourselves by the northwest corner and began to set our plan in motion. Rokh cast a light spell near our starting point. Before we proceeded, Rokh asked for Tymora's guidance via the overused divination spell. She responded with, "In darkness and shadow, Shar reigns supreme. Your spells made of light will avail to nothing." Duh. Kiira breached the west wall with a stoneshape spell, about 5 feet from the altar. 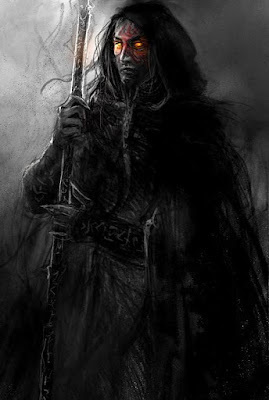 As soon as the dwarf made the hole, Keliantrie cast darkness upon herself and entered the temple — she was to serve as our eyes and ears while within the area of deeper darkness. Wonderboy and Rokh followed closely behind, while I stayed by the doorway preparing to throw some smokesticks at our enemy to even the playing field. 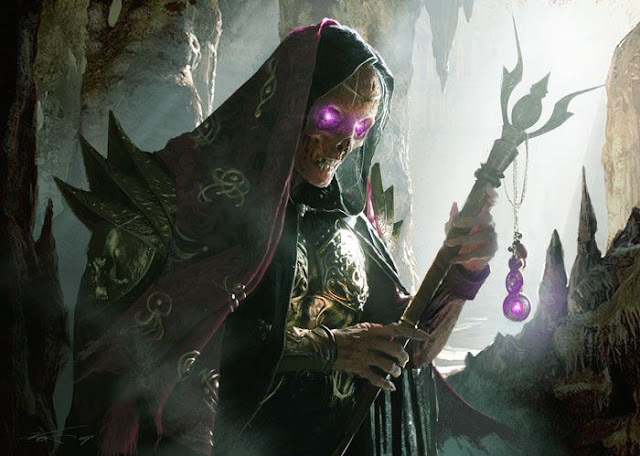 The temple was indeed a dead magic area as we guessed, so we had to rely on the brute force — except the shade, Keliantrie, whose shadow magic worked just fine. The sorceress directed Wonderboy to the heavily armored warrior, and the genasi finished his foe in two strikes of his falchion. 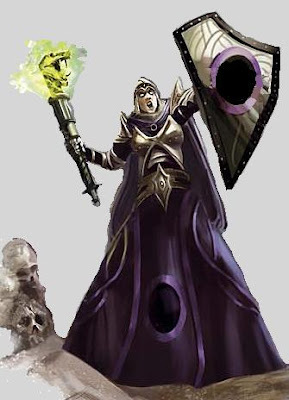 Keliantrie continued to bombard our foes with magic missiles from wands seized from the Sharran mages we killed two days before; she divided her attacks between the male wizard and the female priestess (whose eyes were glowing red, probably a darkness-seeing spell). The young woman, whom we now assume to be Alenor Moonstar, daughter of a Vanrak Moonstar the Dark Ranger, was alive and kicking again. 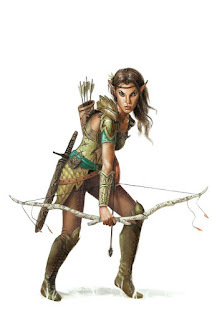 She fired her crossbow at Kiira a couple of times, but she was again cleaved in half by the dwarf. Rokh engaged at the female mage, who gave him a hard time with her defensive spells and practiced tactics with her male counterpart. Wonderboy moved on to engage the priestess, who had just finished casting enhancement spells on her shield and armor. The battle was taking too long, so Rokh and Kiira resorted to bullrushing their respective opponents into the hole we made. At least outside the dead magic area they could use their spells against the Sharrans even if it meant extending the combat for a couple more rounds. Wonderboy wanted to do the same to the priestess. Unfortunately, he had already taken too much damage. 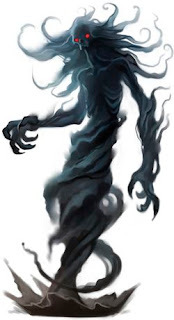 A critical hit from the Sharran felled the mighty earth the genasi, sending his soul on a date with Kelemvor on the Fugue Plain. I believe his last words were, "In the kingdom of the blind, everybody has a 50% miss chance." Clever fool. It was only at this point that we realized that even our foes couldn't see in the dark, except for the priestess. 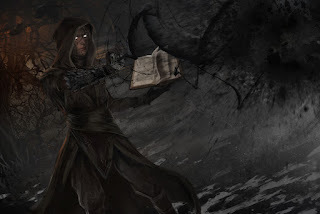 Keliantrie heard whispers from the cleric, directing her allies as Keliantrie directed us, but was using some kind of multi-recipient communication spell. Rokh and Kiira continued to push the mages out the hole, but the priestess ran out the hole herself. She cast a heal spell on herself as soon as she got out. 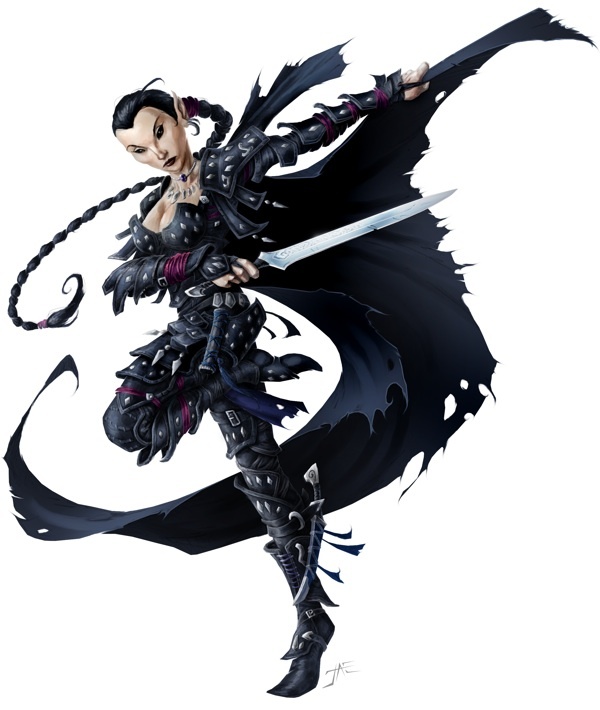 I also ran out the corridor and cast darkness 25 feet from the hole so Keliantrie could use her shadowstride ability to quickly pursue the fleeing priestess. The mages followed their priestess up the northwest stairs when they were forced out of the temple. Rokh used his celestial armor's fly ability to pursue our foes upstairs. He took the northeast stairs while the rest of us took the northwest. We sandwiched them on the north corridor on the upper floor, but they weren't going to give up without a fight. Our clerics used to their most powerful offensive spells, which included searing light and flame strike, wishing to quickly end the battle. The sorceress likewise used her magic missiles and Melf's acid arrows. 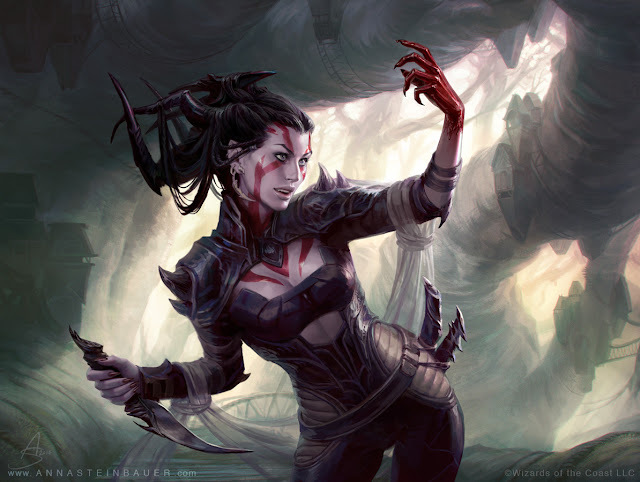 The enemy mages however responded with spectral hand-delivered spells like vampiric touch, which caused damage to us and healed themselves at the same time. The priestess used slay living on Rokh who barely survived the attack. Keliantrie cast web on the mages, Kiira burned it with her flaming battle axe and scorched our opponents. Rokh and I flanked the priestess which gave the aasimar a better chance of hitting her in conjunction with my inspire courage ability. Keliantrie finally finished off the mages with magic missiles when Kiira diverted their shields away from the shade's line of sight. A final blow from Keliantrie's acid arrow wand killed the priestess, ending the three day-long battle in Shar's temple. We killed seven major Sharran officials, plus several underlings who were powerful themselves. We lost one companion, however. We found the rod we were looking for with the priestess's gear. We let Keliantrie carry it for fear of repercussions from handling Shadow Weave (our new word for the day) items. Aside from the various potions, we got ourselves some pretty sweet magic items from our enemies. Kiira sent a sending message to high priestess Naneatha Suaril: "Mission accomplished. In Trollbark Forest, Dark Ranger dead, other higher-ups dead. Send assistance if you want to question dead people." Naneatha replied that she just wanted us to return to Waterdeep with the artifact. Out of spells, no more potions, and badly wounded, we decided to stay for another day to recover our health. The next day, we finally went out of that dismal place (but not before defacing the altar). Keliantrie led us to a group of horses that she found during her "absence" and off we went. While traveling over the grasslands, we saw a number of blink dogs fighting a pair of displacer beasts. We made short work of the beasts, but sadly four of the blink dogs have already been killed. Kiira, who always had a thing for dogs, took the carcasses, intending to raise one of them back from the dead. We reached The Way Inn and finally got some nice beds and good meals. We asked around about the Selûnite priestess we found (whose body we brought along, by the way), and they did say that she disappeared a few days before, so her story checked out. We sold some of the masterwork items we found so we could have enough money to buy a diamond for Wonderboy's raise dead spell. However, we decided not to raise Wonderboy just yet, since we could get a true resurrection spell when we get to Waterdeep. Kiira raised one of the blink dogs instead, the one that may have been the alpha male. When the dog returned to life, Kiira cast a tongues spell and talked to the dog, asking if she could have him for a companion. The dog agreed to serve her for a year, after which he must return to the wild. (It is unclear, however, if the dog agreed to be called Stiffy.) For the duration of the tongues spell, Kiira taught the dog some tricks and tasks, and she was happy. Shallow, shallow dwarf. We set out for Waterdeep that same morning. We hitched with a caravan that was also headed for the City of Splendors. The caravan seemed to be some kind of circus, with various exotic animals from the South. One wagon, apparently alone, was driven by a bald guy in red robes. He was probably a Red Wizard of Thay bringing in supplies for their enclave in Waterdeep. When we got to Waterdeep's South Gate, the guard asked us some routine questions like where we were from, how long ago we left Waterdeep, and so on. 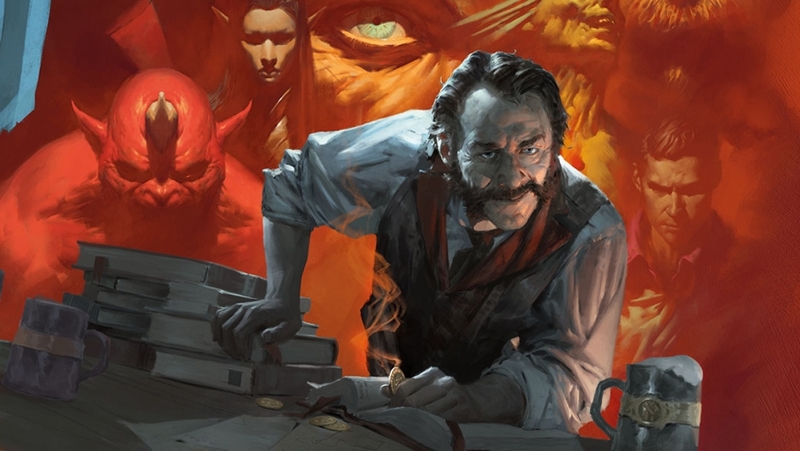 However, when we said we teleported out of Waterdeep more than a tenday before, an officer told us that teleportation, whether into or out from the city, is forbidden, as is any kind of flashy magic like flight. He was kind enough to let us go since it was our first offense (there will probably be more later). A crazy person at the gate was shouting about "snakes moving the realm" or "snakes will take over Waterdeep." This was obviously an adventure hook but we paid him no heed. We went to Selûne's Smile first and fetched Kyriani, then we all went to the House of Moon and Stars. Naneatha was happy to have the artifact once again. They never told us what it was, but in hindsight I believe it was the Rod of Oblivion, a weapon that once belonged to Shar herself. 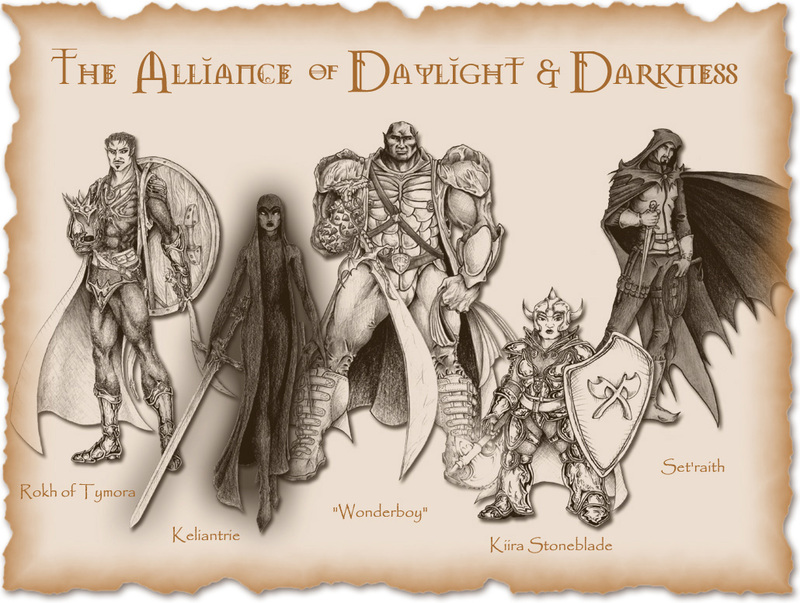 And so the first adventure of the Alliance of Daylight & Darkness concludes.